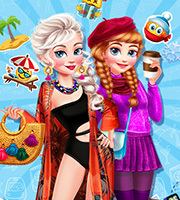 Description: The sisters want to get away from winter in this new dressup game called Frozen Sisters Winter Escape! Eliza and Annie want to go out in a warm location for the winter. Help them get cute outfits and enjoy spending time with them in this cute new dressup game!